Running the PostgreSQL interactive terminal program, called psql, which allows you to interactively enter, edit, and execute SQL commands. At the time of installing postgres to your operating system, it creates an "initial DB" and starts the postgres server domain running. Typically initdb creates a table named "postgres" owned by user "current logged in user name"
At the command line in your operating system, type the following command. To view help for psql commands, type \?. To view help for SQL commands, type \h. To view information about the current database connection, type \conninfo. 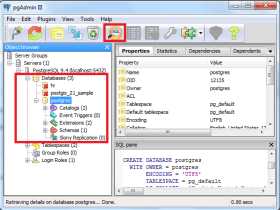 To list the database's tables and their respective owners, type \dt. To list all of the tables, views, and sequences in the database, type \z. To exit the psql program, type \q. psql is a terminal-based front-end to PostgreSQL. It enables you to type in queries interactively, sent them to PostgreSQL, and see the query results. --echo-all Print all nonempty input lines to standard output as they are read. This is equivalent to setting the variable ECHO to all. --no-align Switches to unaligned output mode. --command=command Specifies that psql is to execute one command string, command, and then exit. This is useful in shell scripts. Start-up files (psqlrc and ~/.psqlrc) are ignored with this option. --dbname=dbname Secifies the name of the database to connect to. This is equivalent to specifying dbname as the first non-option argument on the command line. --echo-queries Copy all SQL commands sent to the server to standard output as well. This is equivalent to setting the variable ECHO to queries. --echo-hidden Use the file filename as the source of commands instead of reading commands interactively. After the file is processed, psql terminates. This is in many ways equivalent to the meta-command \i. --field-separator=separator Use separator as the field separator for unaligned output. This is equivalent to \pset fieldsep or \f. --host=hostname Specifies the host name of the machine on which the server is running. If the value begins with a slash, it is used as the directory for the Unix-domain socket. --html Turn on HTML tabular output. This is equivalent to \pset format html or the \H command. --list List all available databases, then exit. Other non-connection options are ignored. This is similar to the meta-command \list. --log-file=filename Write all query output into file filename, in addition to the normal output destination. --no-readline Do not use Readline for line editing and do not use the command history. This can be useful to turn off tab expansion when cutting and pasting. --output=filename Put all query output into file filename. This is equivalent to the command \o. --port=port Specifies the TCP port or the local Unix-domain socket file extension on which the server is listening for connections. Defaults to the value of the PGPORT environment variable or, if not set, to the port specified at compile time, usually 5432. --pset=assignment Specifies printing options, in the style of \pset. Note that here you have to separate name and value with an equal sign instead of space. For example, to set the output format to LaTeX, you could write -P format=latex. --quiet Specifies that psql should do its work quietly. By default, it prints welcome messages and various informational output. If this option is used, none of this happens. This is useful with the -c option. This is equivalent to setting the variable QUIET to on. --record-separator=separator Use separator as the record separator for unaligned output. --single-line Runs in single-line mode where a newline terminates an SQL command, as a semicolon does. --tuples-only Turnoff printing of column names and result row count footers, etc. --table-attr=table_options Specifies options to be placed within the HTML table tag. See \pset for details. --variable=assignment Perform a variable assignment, like the \set meta-command. Note that you must separate name and value if any, by an equal sign on the command line. --version Print the psql version and exit. --password Force psql to prompt for a password before connecting to a database. --expanded Turn on the expanded table formatting mode. --no-psqlrc Do not read the start-up file. --field-separator-zero Set the field separator for unaligned output to a zero byte. --record-separator-zero Set the record separator for unaligned output to a zero byte. This is useful for interfacing, for example, with xargs -0. --single-transaction When psql executes a script with the -f option, adding this option wraps BEGIN/COMMIT around the script to execute it as a single transaction. This ensures that either all the commands complete successfully, or no changes are applied. --help Show help about psql command line arguments and exit. 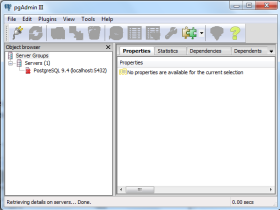 You can also connect to PostgreSQL database using pgAdmin GUI application. 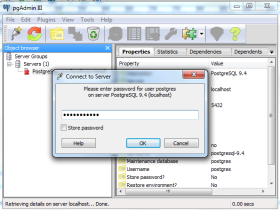 Connect to the database at localhost:5432 using the user name postgres and the password supplied. Now, double click on PostgreSQL 9.4 under the "Servers Groups". pgAdmin will ask you for a password. You have to supply the password for the postgres user for authentication.